With a relatively minor 5.7.2 update released last night, The Iconfactory added an ingenious Edit Tweet button in Twitterrific for iOS, cleverly sidestepping Twitter’s lack of official support for such functionality with a native integration. The topic of an Edit button for Twitter has surfaced on multiple occasions over the years, but so far the company has always resisted the idea of allowing users to modify a status update that’s already been tweeted, preferring a delete mechanism that simply deletes a public tweet from a user’s account. There’s an argument to be made for the reason why it may be useful to be able to fix typos or other errors in a tweet, but as things stand today, Twitter doesn’t officially support an Edit feature, and likely won’t any time soon. The latest Twitterrific uses the possibility to delete your own tweets to fake an Edit button that, to the end user that doesn’t know about Twitter’s stance on the matter, looks like a real editing functionality. The way the Edit button in Twitterrific works is, indeed, smart: once you’ve tweeted a message, an Edit Tweet button gets added to the tweet’s contextual menu; tap it, and the Compose screen will come up again, containing the text of the original tweet that you can edit. Twitterrific, however, isn’t actually editing the tweet: after tapping the Edit button, the original tweet gets deleted from Twitter and its contents are inserted in the screen to compose a new tweet. This gives the illusion that the original tweet is being edited, while Twitterrific is only deleting and creating tweets as allowed by the Twitter API. Twitterrific’s Edit Tweet button is a minor touch, and nothing that couldn’t be replicated by copying a tweet, deleting it, and starting a new one. From a user experience standpoint, though, Edit Tweet serves as a shortcut and elegant workaround that gives users the ability to fix what they tweeted while saving taps. It is the kind of feature that makes sense when you see it in action, and the implementation in Twitterrific is straightforward and polished. 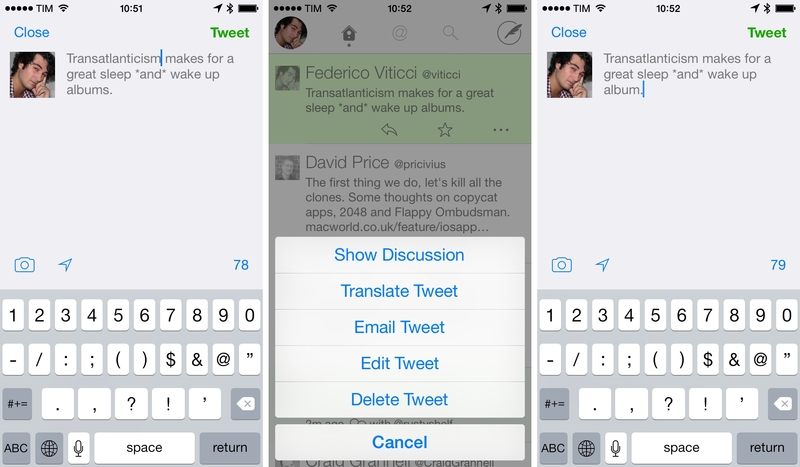 Twitterrific 5.7.2 is available on the App Store.